It is becoming more evident that as consumers we have an addiction to plastic and it is a habit that is in desperate need of breaking. Plastic is an escalating problem globally. In particular, single-use plastics such as bottle caps, plastic bags, straws and so on are more frequently being found in our oceans or tangled around or ingested by marine life. Micro-plastics are another major component of ocean pollution. Plastic products that are not recycled end up somewhere and that could be in landfills or as debris polluting the environment, rivers, lakes, and oceans which is problematic. Somewhere along the way the ocean has become a trash can, and it was never intended or designed to be one. Our oceans serve as a home to marine life, coral reefs and ecosystems all of which depend on a healthy ocean for their survival— we depend on a healthy ocean for our survival. We view the ocean as this indestructible resource, however, even the ocean has its limits and plastic pollution disrupts the health of the ocean and is harmful to marine life. Some marine life become entangled in plastic and it often results in their death. While other marine life, ingest plastic which can also result in their death. That being said, the fish that we consume, is highly likely to have consumed plastic particles or micro-plastics and that could be problematic to our health in the future. As plastic pollution in our oceans is a growing issue and concern globally, it implores us to re-evaluate our consumption habits. It is so easy to develop a disconnect once trash is tossed out or put in a landfill. We tend not to think about where it ends up, it quickly becomes out of sight and out of mind and from that it is easy to disregard the implications it might have on the place it ends up. The thing is there is no “away” our trash goes somewhere. Plastic is found everywhere! 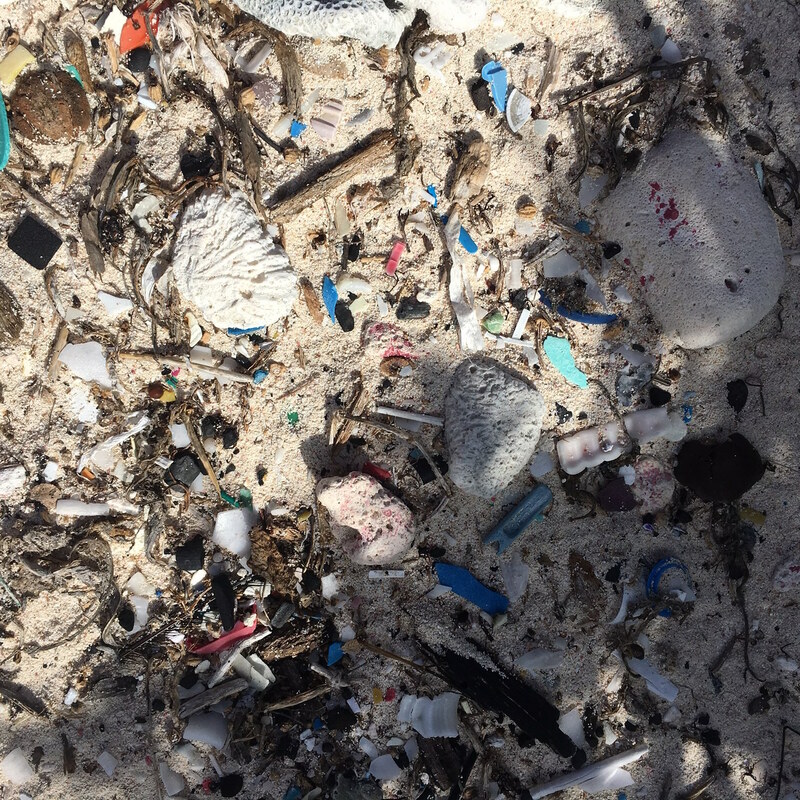 The magnitude of plastic that has accumulated in oceans and on land is astonishing. It is so easy not to think about it if we don’t see where it directly ends up or the implications it results in. The bottom line is we are all affected by the implications of plastic polluting oceans and our environment, it affects us just as much as it does animals and our environment. We need to be more conscious and aware of where our trash goes, we need to rethink what products we buy as consumers, and evaluate what environmental impact they have once discarded. Both consumers and producers need to rethink the packaging of products that are consumed, especially single-use plastic items. We should ask ourselves can we live without this product or is there a better alternative? In some instances, the answer is yes. For example, making small changes such as eliminating the use of straws, plastic bags and plastic bottles from our daily lives can create a positive impact. 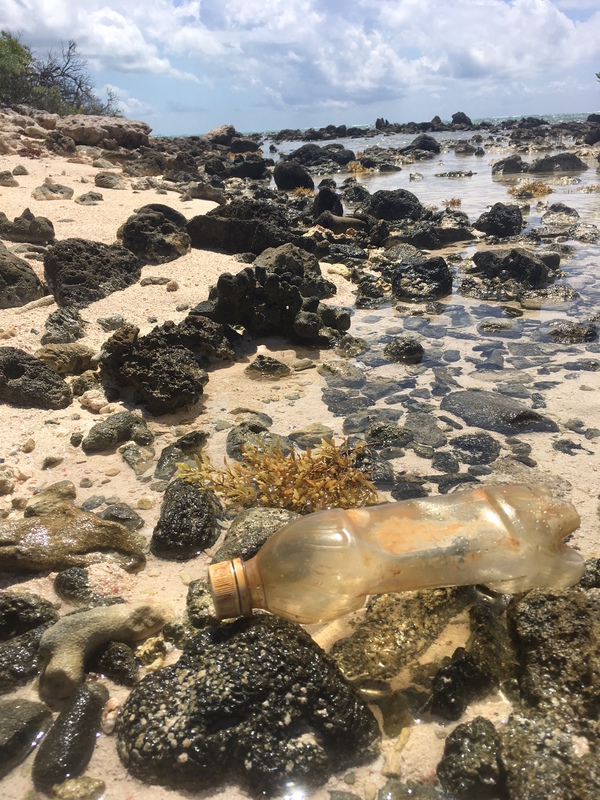 Local Founder of Plastic-Free Cayman, Claire Hughes, was inspired after watching the documentary A Plastic Ocean to do her part in helping shift the Cayman Islands towards being single use plastic-free, or as close to it as possible. Her first plan of action was to start a Plastic Bag Ban petition. Plastic such as grocery bags which end up in the ocean cause serious harm to turtles and other marine life. For instance, turtles might mistake a plastic bag for a jellyfish, a normal part of their diet. Once the stomach is full of plastic it is a slow painful death for the animal as it physically cannot ingest any nutritious food the animal becomes malnourished and dies from starvation. Plastic also disrupts the turtle’s natural ability to manage its buoyancy, preventing the turtle from diving down for food it can only float on the surface leading to severe sunburn and eventual starvation. Additionally, plastic breaks up in the ocean into small pieces of plastic which can be mistaken for food by many types of marine life. 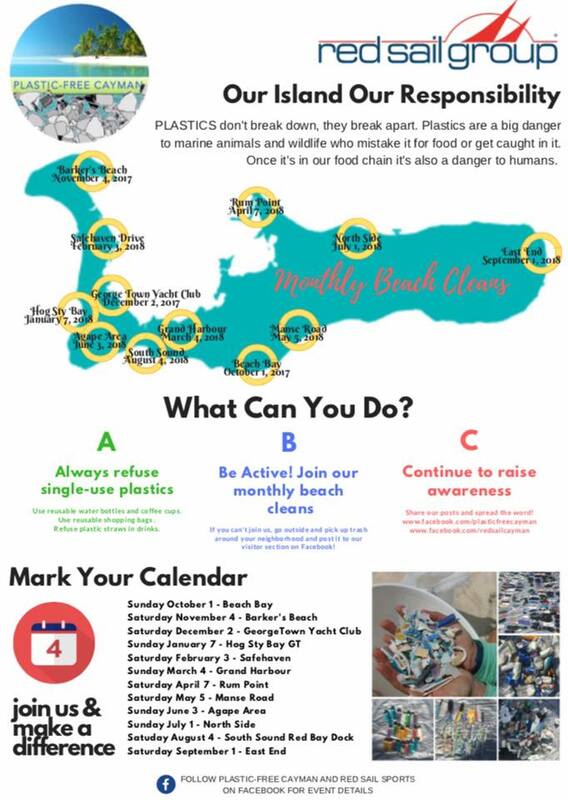 Plastic-Free Cayman’s aim is to raise awareness, educate and act on reducing single use plastics in the Cayman Islands. 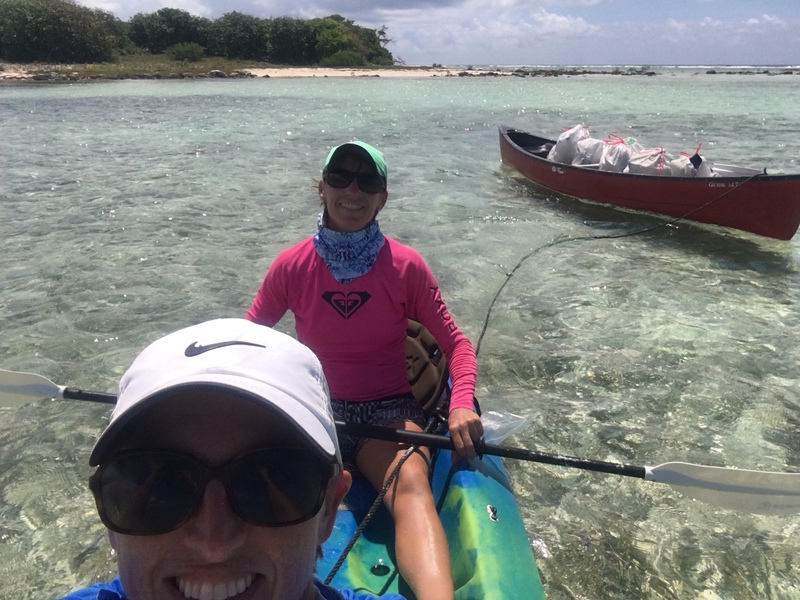 While on a trip to Little Cayman, Claire and her family scooped up a plastic bag floating in the sea while kayaking. 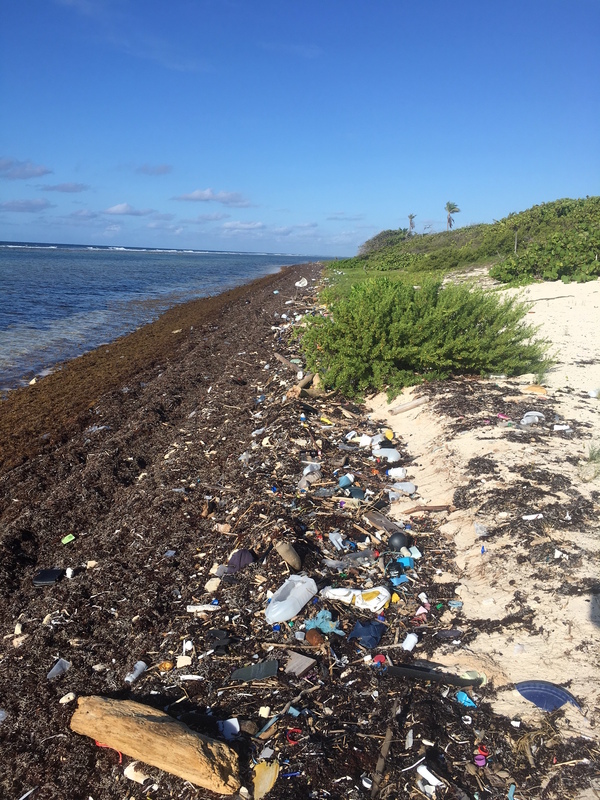 Claire and her family did a beach clean up while on holiday in Little Cayman after they were shocked to find trash on the beaches and wanted to leave the beach cleaner than they found it. Trash is not something one expects to find while vacationing on an island. Seeing trash littered along the beaches really hit home, and encouraged her to start a dialogue about the harm plastic causes in our oceans and to marine life. As a teacher, she has had the opportunity to educate Cayman’s youth about plastic in our oceans by showing them the 22 minute educational version of A Plastic Ocean. 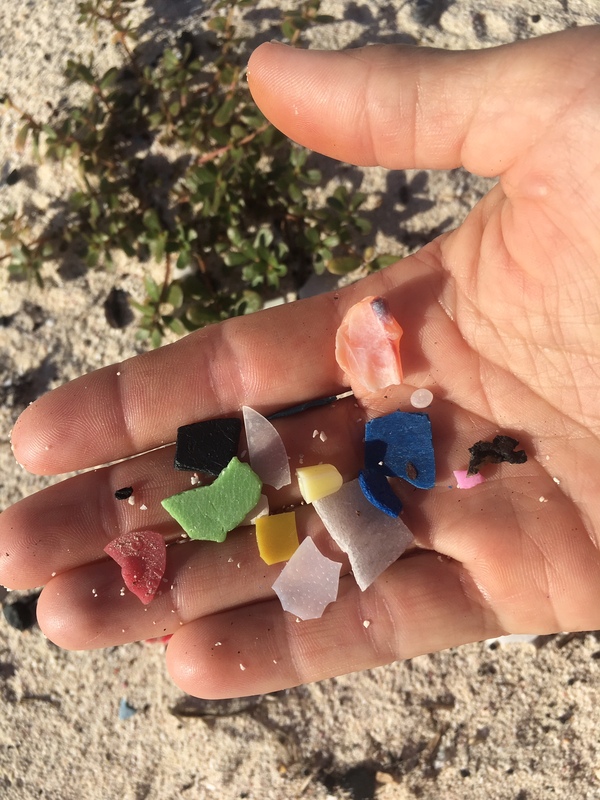 Plastic-Free Cayman is expanding its efforts of eliminating plastic on our islands by teaming up Red Sail Sports Cayman to initiate an island wide beach clean up once a month over the next 12 months. The public is invited to come together as a community to clean up our beaches. Sadly, even paradise is not immune to plastic and other items of trash washing up on our beaches or floating in the sea. We can all do our part to help save our oceans and joining in a community beach clean up is a great way to make a positive impact. Even spending 5 minutes out of our day to pick up trash along the beach or side of the road helps to make a positive impact. 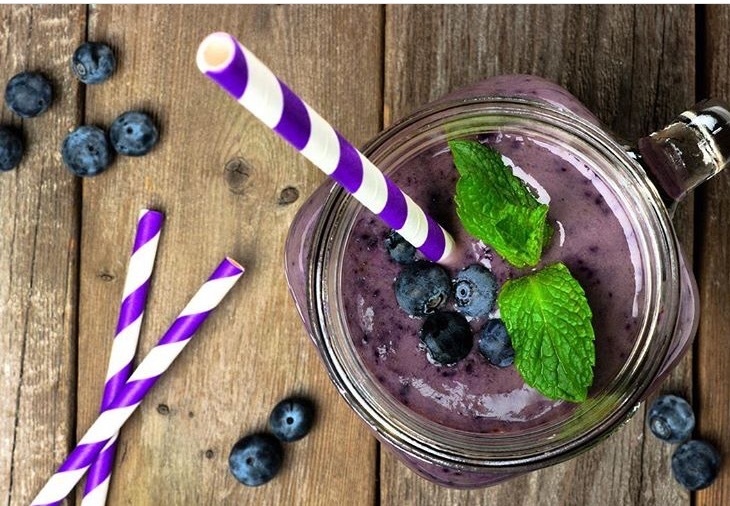 Local establishments: Sunset House, Island Naturals Cafe, The Greenhouse, Vivo, Catch Restaurant, Rum Point and Royal Palms are doing their part by switching from plastic straws to paper ones.